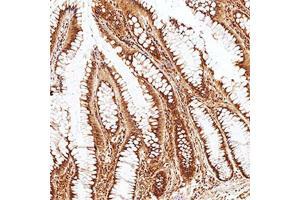 Immunohistochemistry-Paraffin: Phospholipase D2 Antibody - IHC analysis of formalin fixed paraffin-embedded (FFPE) human colon cancer using Phospholipase D2 antibody at 1:100 on a Bond Rx autostainer (Leica Biosystems). The assay involved 20 minutes of heat induced antigen retrieval (HIER) using 10mM sodium citrate buffer (pH 6.0) and endogenous peroxidase quenching with peroxide block. The sections were incubated with primary antibody for 30 minutes and Bond Polymer Refine Detection (Leica Biosystems) with DAB was used for signal development followed by counterstaining with hematoxylin. Whole slide scanning and capturing of representative images was performed using Aperio AT2 (Leica Biosystems). Cytoplasmic staining was observed. Staining was performed by Histowiz. Immunogène Within the range amino acids 199-230 of human PLD2 protein were used as the immunogen.